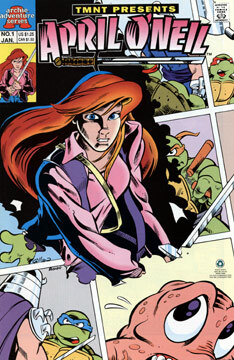 After returning from Japan, April bid farewell to Fu Sheng and Chu Hsi (the human alter ego of The Warrior Dragon who first appeared in TMNT Adventures #20), and returned home with her friend Oyuki, where O’Neil had many messages waiting for her on the answering machine – several of them from her upset employer, Murdoch Maxwell. April hurried out to go to the office and explain to her boss why she’d been absent, but as she rode on the subway it suddenly stopped and was attacked by a band of ninjas from the Dog Star Gang (who were after a group of men from the rival gang, Golden Triangle). As O’Neil helped an old woman escape the violence, a shuriken narrowly missed hitting her. April grabbed the throwing star and tossed it towards one of the Dog Star ninjas – striking him in the shoulder and causing him to drop his magic sword. O’Neil grabbed the strangely glowing blade and leaped into thr fray, turning the tide of the fight in favor of the Golden Triangle, who then noticed the empowered weapons of their foes and set about disarming them. The Dog Stars were forced into retreat and vanished after dropping a smoke grenade. The leader of the Golden Triangle thanked April for her assitance, but O’Neil wasn’t pleased once she recognized them as the “scourge of Chinatown.” The gang leader insisted that they protected the neighborhood from rival gangs – but he also revealed that they only did this for people who bought their “insurance policies.” The train then lurched into motion and the Golden Triangle members began leaping off. Their spokesperson, Wing Min, grabbed the sword out of April’s hand and called out to O’Neil that he owed her a favor as the subway sped off. April finally made it to Maxwell’s office, who promptly fired her. Once April gets back to her apartment, she rummages through a closet and finds a video camera. She hands it to Oyuki and tells her that they’re going freelance. Elsewhere, Wing Min of the Golden Triangle presents the black magic empowered weapons that were taken from the Dog Star gang to his master, who declares that he’ll have to become personally involved in the skirmish. Additional Material: Six page Inky (Tattoo’s dog) story by Dean Clarrain and Eric Talbot.